Laura was the second of five children born to religious Jewish parents in the industrial city of Lvov. She was often called affectionately by her nickname, Lorka. Coming from an educated family living in a multi-ethnic part of Poland, she grew up speaking Polish, Russian, German and Yiddish. As a young woman, she earned a humanities degree from St. Nicholas University in Lvov. 1933-39: In April 1935 Laura became Mrs. Daniel Schwarzwald. Her husband was a successful lumber exporter, and they lived in a spacious apartment in a fashionable district. In 1937 their daughter was born. Fearing war, Daniel urged Laura to immigrate, but she was scared to abandon her parents. When German and Soviet forces invaded Poland in September 1939, Lvov was annexed to Soviet Ukraine and Daniel's business was expropriated by the communists. 1940-44: The Germans took over Lvov in 1941, and in 1942 Daniel was shot. After that, Laura and her daughter used false IDs that Daniel had bought them. 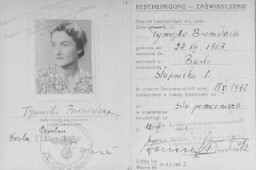 Laura became Bronislawa Tymejko, a Polish Catholic, and found a job interpreting for the German command in the resort town of Busko-Zdroj. Sidewalks there were paved with Jewish gravestones. Her job made the local Polish underground suspect she was a collaborator, so she took the added risk of teaching in one of the underground's schools to prove she was a Polish patriot. The penalty for getting caught was death. The town of Busko-Zdroj was liberated by Soviet forces in January 1945. Laura and her daughter immigrated to England in 1948. Laura settled in the United States in 1972. 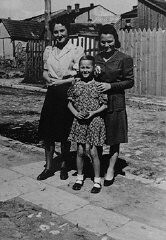 Photo Selma Schwarzwald and her mother, Laura, in Busko-Zdroj on the occasion of Selma's first communion in 1945.